The average score of the managers in GW19 was 77 taking into account point deductions for extra transfers. That’s compared to the game average of 59. That’s 18 points and 30% above the game average score. High score of the 10 was 104. The low score was 53. A incredibly high spread of 51 for a relatively high scoring gameweek. The average overall rank of the top 10 FPL managers is 40k an improvement of rank from last week 42k. The best overall rank is now in the top 50 and the lowest 141k. The top 10k captain choice (from the excellent free site FPL discovery) was 45% Kane and 35% Salah. The FFGeek poll this time was not that consistent. 9 of the 10 managers made a transfer. 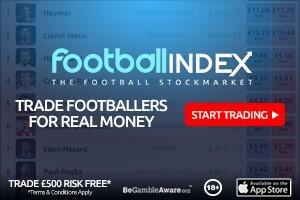 The top 10k average score was 73 compared to the 10 top managers average of 77. So that’s 6 essentials and 2 maybes. This leaves room for 7 differentials/bench two pointers. Here’s the 3rd top total points scoring manager who currently has an OR of 21k. His team value is £103.6m. A fantastic score of 95 this week. He owns 5 of the essential 6 (Patricio for Doherty) and both 2nd tier “essentials” of Wan Bissaka and Alonso. So his template replacement player of Chambers was on his bench but West Ham didn’t get a clean sheet anyway. Of his 4 starting non template players out of 3 returned, 2 with big scores, hence a 22k green arrow. 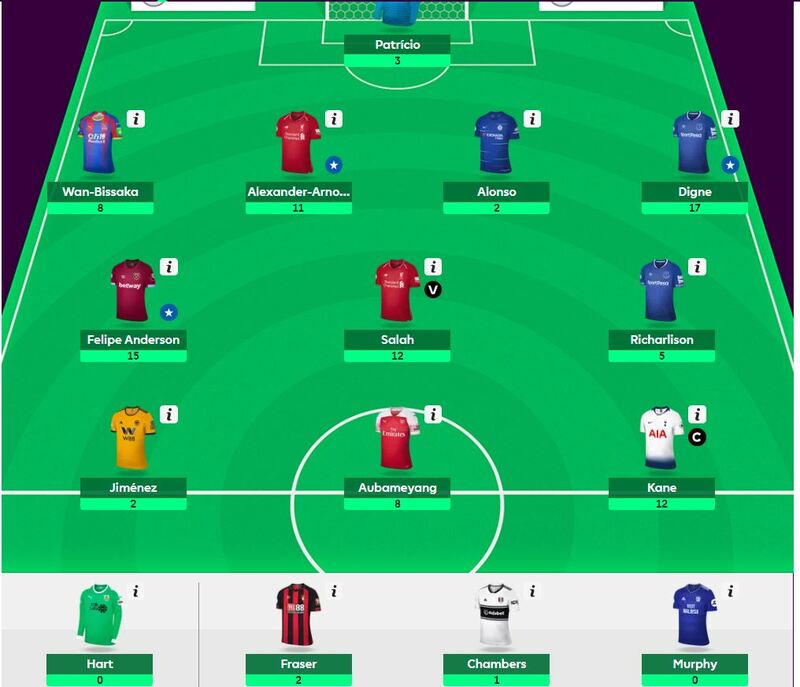 quick question re wildcard if anyone can help..can i activate it immediately after the last round of GW20 as I still have not used the pre Dec 31 WC. Have 2 transfers this week pre so wanted to use them and then WC after but wanted to ensure it doesnt void the first one and activate the second half of the season one! 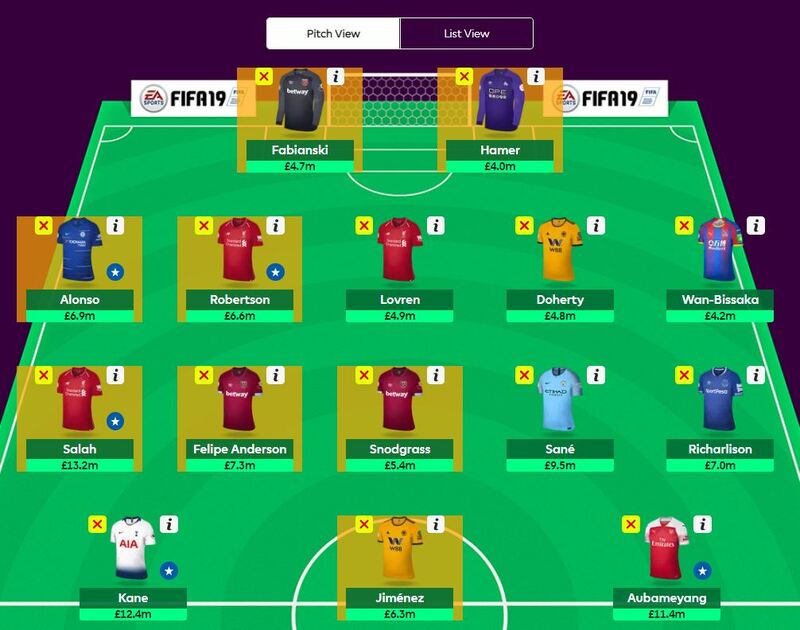 Yup..I think I saw it at FPL site somewhere that the first wildcard deadline is the same as that of the last game week of the year which is tomorrow….so activate it and start the mind torment which is picking up a team from scratch….and don’t worry about the 2FTs….they will come back again..Cheers! I would suggest it would activate the 2nd one as GW20 is next year? The Wildcard chip can be used twice a season, once in the first half of the season (before 29 Dec 14:00) and once in the second half of the season. no man city defensive coverage. surprising!